The RG series cryogenic regulators are primarily designed to maintain pressure on cryogenic liquid within cryogenic containers. They may also be used in cryogenic lines, vaporizer and converter applications. They are especially useful in installations where space and cost limitations are important. • All parts are copper alloy (brass), PTFE and stainless steel—materials selected specifically for compatibility with cryogenic temperatures down to -320°F. • Body and bonnet machined from solid brass bar stock. • PTFE seat helps assure a positive shut-off at cryogenic temperatures down to -320°F. 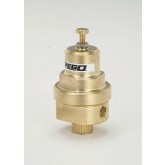 • High and low pressure regulators are the same compact size—designed to fit in close quarters. • Interchangeable with existing cryogenic regulator units. 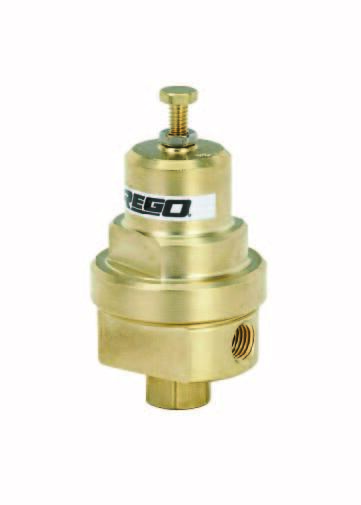 • Inlet filter helps prevent foreign material from entering the regulator. • Locknut is provided to maintain adjusting screw setting. • Maximum inlet pressure of 550 PSIG. Regulator, Cryogenic Pre-Set to 125 PSIG - 3.8"